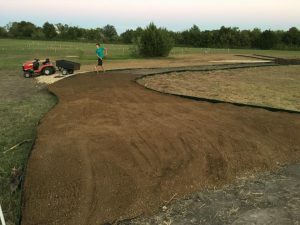 Things have been busy at the Central Texas Archery field and we could not be MORE EXCITED! Austin is so fortunate to have gotten such a significant amount of rain since we opened Central Texas Archery. However, this has wreaked havoc on our property and made getting on site treacherous at times. Our new driveway has made getting to the parking lot so much easier and now we don't have to worry about the mud so much! Our front sign got an update and is ready for Halloween. Stay tuned after October when we update it again and make it easier to read from the road. IMPORTANT!!!! - Last day to register is TODAY!!!!! Our biggest fall event is our Inside Out Tournament. Haven't registered yet? Click here! We will have raffles and prizes all weekend. There is a Lancaster gift card up for grabs and we have gift cards from Bird's Barbershop, Whataburger, and The Texas Stars Hockey Team! For new and experienced archers. Bring your friends and bring your bow! 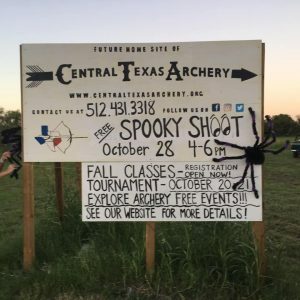 Field will be open for experienced archers to shoot while new archers can try out archery with our equipment and our SPOOKY targets! Prizes, trick or treating, and raffles! Wear a costume, win a prize! Love us? Let the world know! Since we are brand new, people who are not familiar with us don't know how fun archery is and how much we love archery at Central Texas Archery. YOU can help spread the word by posting a review on Yelp, Google, Facebook, or Groupon (if you purchased one). Have a less than stellar experience? We want to know that too. We are growing and learning and your feedback is important to us. Central Texas Archery is a community and we value and appreciate all of you who have chosen to be a part of our archery family! The best way to stay up to date with Central Texas Archery is on our Facebook page. It is the first place we post weather related information. It is also a great place to connect with other archers, see progress on the property, hear about new events, and ask questions. Follow us on facebook at www.facebook.com/centexasarchery We also post photos and information on our Instagram page and we love following our archers on Instagram as well. On Instagram, we are CentralTexasArchery.